Hi, I am Yuriy. 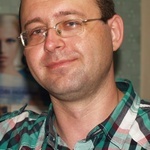 I am a professional English to Russian and Ukrainian translator with 15 years of experience in legal, business and marketing translation, software and website localization,...Read moreHi, I am Yuriy. I am a professional English to Russian and Ukrainian translator with 15 years of experience in legal, business and marketing translation, software and website localization, translation of subtitles. I have a BA in linguistics from Zhytomyr State Univeristy (2000).